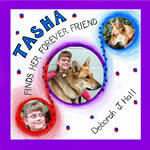 Brief Synopsis: Tasha learns to be an assistance dog and then longs to find a person she can help. Links To Resources: From the Bunny Bud website: BunnyBud Books is offering various coordinating items such as coloring booklets, activity pages, bookmarks, vinyl stickers, various word puzzles, t-shirts, and special packages designed to help you start your own Rainbow Reading Buddies Book Club (posters, display ‘dogs’, etc.). PleaseContact Us for information about these fun additions. Why I Like This Book: This is a very down-to-earth, easy-to-understand story about how dogs are trained to help people and what a difference they can make in the life of someone who needs assistance. Numerous photographs show readers the kinds of things dogs can learn to do, and then how a dog and a person (in this case a young girl with cerebral palsy) learn to work together. But it’s not just about the practicality – the story is also heart-warming as it shows the deep bond that develops between child and dog. The clear, straightforward text and the lovely photographs are very accessible to young readers and will introduce them to the concept of assistance dogs in a very child-friendly way. I have come across this series and love the photos and examples of the many ways in which dogs aid us and our communities. These sorts of books were always very popular in the school library! Funny how we have both picked dogs and friendship. Pets teach us so much, don't they? Have a great weekend, Susanna! This is the first book I've seen on the topic, Susanna, but I am well aware of service dogs. My 60+ cousin's pug is a service dog. I'll have to check it out! Yes. You are THE Punster! 😉 I really like the idea of this book. We learn about a subject that most people don't know about. Rhythm is going to LOVE this one … and I think I am, too. It sounds like a treasure. Thank you for the lead on yet another book for my ever-growing list. I love the opening – the “big ears”. What a neat thing to note about a friend. (or at least someone who will become a friend) Thanks for sharing. I've not seen this particular book, but I am familiar with the series. And it's a GOOD one!!! Thanks for showcasing service dogs!! Makes my day! I'll have to look for Tasha! Susanna, this sounds wonderful!! Thanks for sharing – I will definitely look for a copy. Can't wait for Monday – I've had so much fun checking out everyone's jingles. Oh- BTW, be sure to catch my link to how to make CHOCOLATE scented play dough on my PPBF. That's a lovely heart-warming story that is important for kids to hear. Great choice, Susanna. Have a lovely weekend! Service dogs, what an awesome subject for a book. Hope your e-book launches soon . . .
See ya on Monday, you punny punster! This is the happiest book I have ever heard of! Yay for Assistance Dogs! I have none of the skills or talents or knowledge they have, but I am snugly. This is a great week for dog books and non-fiction. My library bag is getting heavy! Great book, Susanna! Dogs really are man's (and woman's) best friend…and stories like this one might help kids who have a fear of dogs. Thanks for the resource list…I hope that teachers are using your Perfect Picture Book page – I wish I'd had it when I was teaching. I'm looking forward to the jingle contest results – I need to hop over and make sure there aren't any that I've missed reading. 🙂 I absolutely LOVED Erik's video! Oh my goodness! Wasn't it great? That kid is amazing 🙂 I'm looking forward to the jingle voting too! I can't wait to see who everyone picks! And I love books about dogs, and this book is lovely because it really shows how much the dog means to the child on so many levels. I know it, Joanne! That happens to me every week! And I want to read every book right that second, and often times my little library doesn't have them and I have to WAIT! I LOVE, LOVE, LOVE this book! Yay, dogs! Katrina and I are excited to learn about the winner of your Jingle contest, too. You have a nice blog, Miss Susanna. We look forward to reading your new book. Oooh, I really want to read this book! When I was looking into getting our farm dog, I joined the farm dog e-list and saw lots of posts on different things those dogs can do, but a couple of owners' stories really stood out with me and those were the ones who were training their farm dogs to be therapy dogs. Such heart-warming stories of wonderful people training wonderful dogs to help others! I think I could get in serious trouble with chocolate-scented playdough… I would be so tempted to sample it 🙂 It's funny – we had a few dog books this week! Yes, and it's done really well, so that kids can really see what the dogs do and how the child and dog learn to work together. I know, because they're so real. They give you a clear idea of what really happens which I think kids really like. This book does sound heartwarming. Relationships between pets and owners are strong anyway, and I can't imagine the bond between an owner and a dog that provides them a better and safer life. This series looks interesting. Deborah also contacted me and is sending books, but I've just returned from vacation and haven't gotten my mail yet.